Q: When the game starts and you start taking a look at what the other defense is doing in terms of either matching or playing man or whatever, is it common for teams not to show you what their real intention is early and then have you adjust to what they are doing and then they flip to what they really want to do? Coach Kelly: That’s way too smart for me. Q: I don’t think that’s too smart for you. 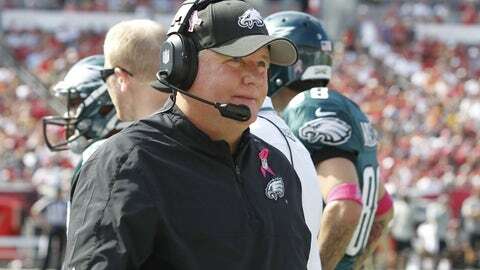 Coach Kelly: I don’t see that, and I know as a play caller we don’t do that. ‘Hey, I’m going to call three [expletive] plays in a row and let them think the next one is going to be [expletive] and then we’re going after them.’ (Laughter) That’s not my mentality. Q: By accident, would you call three poor ones in a row? Coach Kelly: Totally by accident. Kelly is regarded as one of the brightest offensive minds in the league, and he made it official that he won’t be outsmarting himself as a playcaller.